^ Tucker, Gordon & Mary (1983). Griffith-Jones, Bill (ed.). The old slate industry of Pembrokeshire and other parts of South Wales. Volume XXIII/2, Winter. Aberystwyth: National Library of Wales journal. ^ Holroyd, Michael (2002). "Augustus John". In Mintle, Justin (ed.). Makers of Modern Culture. Volume 1. London and New York: Routledge. ISBN 978-0-415-26583-6. Retrieved 29 January 2018. Jones, Francis (1996). Innes-Smith, Robert (ed.). Historic Houses of Pembrokeshire and Their Families (First ed.). Dinas: Brawdy Books. ISBN 978-0-9528344-0-3. Dyfed is a preserved county of Wales. It was created on 1 April 1974, as an amalgamation of the three pre-existing counties of Cardiganshire, Carmarthenshire and Pembrokeshire. It was abolished twenty-two years later, on 1 April 1996, when the three original counties were reinstated, Cardiganshire being renamed Ceredigion the following day. 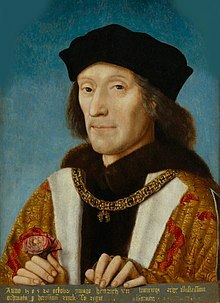 The name "Dyfed" is retained for certain ceremonial and other purposes. It is a mostly rural county in southwestern Wales with a coastline on the Irish Sea and the Bristol Channel. The Pembrokeshire Coast Path, also often called the Pembrokeshire Coastal Path, is a designated National Trail in Pembrokeshire, southwest Wales. It was established in 1970, and is 186 miles (299 km) long, mostly at cliff-top level, with a total of 35,000 feet (11,000 m) of ascent and descent. At its highest point – Pen yr afr, on Cemaes Head – it reaches a height of 574 feet (175 m), and at its lowest point – Sandy Haven crossing, near Milford Haven – it is just 6 feet (2 m) above low water. Whilst most of the coastline faces west, it offers – at varying points – coastal views in every direction of the compass. 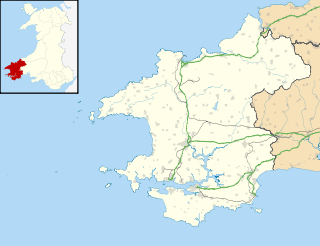 Haverfordwest is the county town of Pembrokeshire, Wales, and the most populous urban area in Pembrokeshire with a population of 13,367 in 2001, though its community boundaries made it the second-most populous settlement in the county, with 10,812 people. The 2011 census quoted a population of only 12,042 living within the confines of the parish. This agreed with the total population of all five wards involved: Castle, Prendergast, Portfield, Priory and Garth. Merlin's Bridge is a separate village and community situated to the south. Preseli Pembrokeshire is a constituency of the House of Commons of the Parliament of the United Kingdom. It elects one Member of Parliament (MP) by the first past the post system of election. The West Wales lines are a group of railway lines from Swansea through Carmarthenshire to Pembrokeshire, West Wales. The main part runs from Swansea to Carmarthen and Whitland, where it becomes three branches to Fishguard, Milford Haven and Pembroke Dock. The River Cleddau consists of the Eastern and Western Cleddau rivers in Pembrokeshire, west Wales. They unite to form the Daugleddau estuary and the important harbour of Milford Haven. Preseli Pembrokeshire was one of six local government districts of Dyfed in West Wales from 1974 to 1996. Until 1987 the name of the district was Preseli. The district took its name from the Preseli Hills. The A477 is a major road in South Pembrokeshire and Carmarthenshire connecting St Clears and Johnston. Its route includes the Cleddau Bridge, a toll bridge linking Pembroke Dock and Neyland. Maenclochog is a village and community in Pembrokeshire, south-west Wales. It is also the name of an electoral ward comprising a wider area of four surrounding communities. Maenclochog Community includes the small settlement of Llanycefn. This is a list of the Sites of Special Scientific Interest (SSSIs) in the Pembrokeshire Area of Search (AoS).